Author: MacLeod, Ian R. Set In . . .
Aether is industry, industry is magic and the Great Guilds rule the known world. Raised amid the smokestakes, terraced houses and endless subterranean pounding of the aether engines of the Yorkshire town of Bracebridge, Robert Borrows is nevertheless convinced that life holds a greater destiny than merely working endless shifts for one of the Lesser Guilds. Then, on a day out with his mother to the strange gardens and weirdly encrusted towers of a remote mansion, he encounters a wizened changeling, and the young girl in her charge called Anna, and glimpses a world of wonder, mystery and surprise. From then on, as he flees to London in the hope of escape and advancement, and explores its wide streets and dark alleys, and all the tiers of society from the lowest to the highest, he comes to realize that he holds the keys to secrets far bigger than even he imagined. 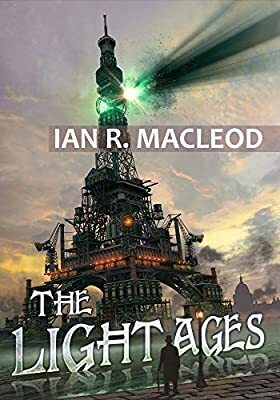 A dazzling melange of Dickens and Peake, flavored with steampunk and magical realism, yet seen through a kaleidoscopically individual gaze, in The Light Ages, double World Fantasy Award winner Ian R MacLeod has created a novel for this and every age.